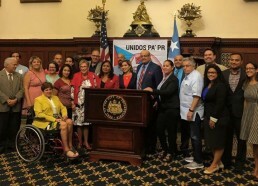 That’s why, when Hurricane Maria ravaged Puerto Rico on September 20, community organizations all over Fairhill and the greater Philadelphia area came together as one to form the supergroup, Unidos PA’PR, a fundraising and relief effort designed to bring aid to the island. Now, the effort continues as communities in Puerto Rico still remain without clean drinking water, electricity, and access to food. Estimates say that it will take six months to a year to restore Puerto Rico’s electrical grid, and even longer to rebuild the many roads, bridges, farms and homes that were destroyed by Maria. Unidos PA’PR will continue to collect monetary donations and hold fundraising events in the weeks and months to come. You can join the effort right now by donating on Unidos PA’PR’s website. 100DaysXPuertoRico is another great resource for ongoing information on how you can take action to advocate for Puerto Rico relief and restructuring. Sign a petition, call, or email your representative and let them know that you care about the future of Puerto Rico.